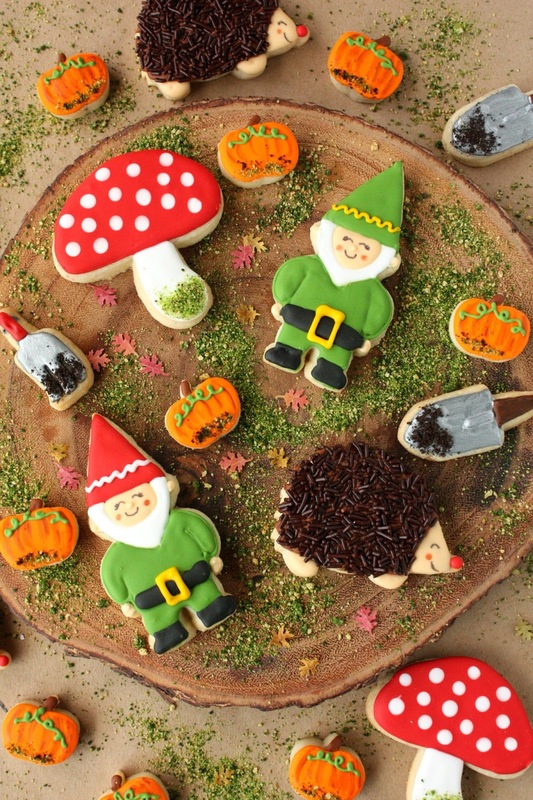 I have wanted to make gnome cookies for awhile, and since fall is my favorite season, I thought now would be the perfect time. I'm rather smitten with these gnomes in their pumpkin patch (another favorite thing)! We tried to grow pumpkins in our garden this year , as we have in the past, but this time, the darn gophers got the best of us, and our pumpkin plants disappeared overnight, literally! Big SIGH. I found these cookie cutters at Cookie Cutter Kingdom, which was the first step in turning my cookie vision into a reality. I had so much fun! See the tiny leaves? I used a leaf shaped, paper punch tool to produce tiny fall leaves, punched from real leaves! Such an authentic, sweet touch. Love the hedgehog...so easy to decorate with cute results. I wish my real garden produced such cuteness! 1. Mix cookie dough and roll out about 3/8-inch thick. 3. Bake according to cookie recipe and allow cookies to cool. 5. Place the tinted frosting in the decorating bags with the appropriate tips (smaller tips for finer details). 6. To decorate gnomes: With the green, medium consistency frosting, outline the green suit. Next, outline the hat in red or green and fill in. Allow to dry for an hour and then fill in the suit. (If you fill it too quickly you will lose definition on the arms, unless you want to detail it afterwards.) When the hat and suit dry for about an hour, add the squiggle detail to the hat is white or yellow. Outline and fill in the beard with the white icing, and the face with the ivory. Add the nose, hands, and ears with the ivory icing. Let dry overnight before adding the facial details with the black and red (cheeks) food markers. 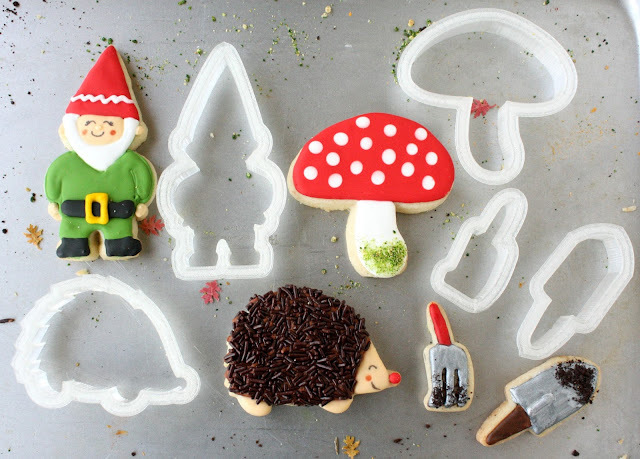 To decorate toadstools: (Of course you can decorate these at the same time as you are decorating the other cookies.) Using red, medium consistency icing, fill in the top part of the toadstool. Immediately add the white dots (tip #1) with the same consistency of icing as the red. (wet on wet decorating). Let the red dry for about an hour and then use white icing to outline and fill in the stem. Sprinkle on some of the moss mix while it is still wet. To decorate the hedgehogs: Outline and fill in the head and feet of the hedgehog with the ivory icing. Let it dry for about 20 minutes and then outline and fill in the body of the hedgehog with the brown icing. While it is still wet add the chocolate jimmies. Add the nose with some red icing. Let dry overnight before adding the facial details with the food markers. To decorate the garden tools: Outline and fill the handles of the tools with the color of your choice. Fill in the bottom part with gray icing (Black mixed with white). (Optional)After drying, add silver dust (mixed with a bit of clear almond extract) and apply it to tools with a small paint brush, used only for food. (Optional) Add some finely crushed chocolate cookie crumbs to wet tool as "dirt". To decorate pumpkins: Outline and fill in the pumpkin with orange icing. Decorate the stem with the brown icing. Let dry. Add the vine with the green icing. Add brown shading details to pumpkin with the grown food marker. They look so gorgeous and FUN!!! Such a adorable set of cookies! Thank you! I LOVE this adorable pumpkin patch scene! Sorry you lost your pumpkins..we don't have gophers but we do have armadillos! You have created such a sweet set of cookies, and that hedgehog is just too cute. Plus, how awesome that you made those tiny, real leaves! Happy Fall, Sue! Your little gnomes are so darn cute! I love these! I am in love with your marshmallow pumpkin patch pops, they're the best kind of pumpkin to find in any patch! Forget about the cookies, you made tiny leaves! Haha, how adorable are they? Seriously though, the cookies are amazing. Those gnomes have the cutest phases and I love how bright and happy they are.